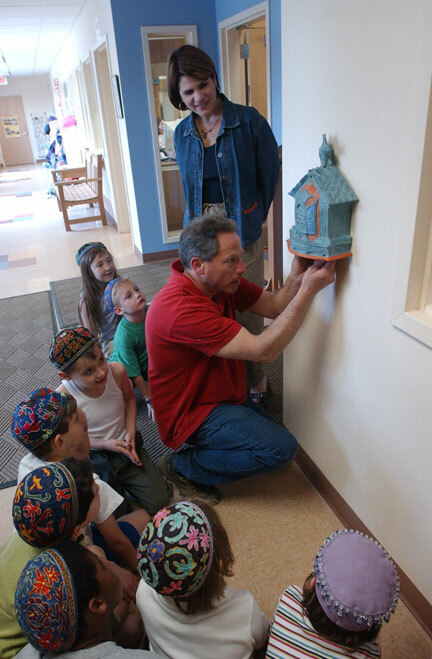 First-grade teacher Judi Glickman-Shnider, standing, and students in her class at the Solomon Schechter Day School of the Pioneer Valley look on as potter Emmett Leader installs a tzedakah box he created for the school. The rough English translation of the Hebrew word “tzedakah” is the word charity, but that translation leaves out much of the spirit of its meaning. Solomon Schechter Day School secong-grade teacher Deborah Bromberg Seltzer said the root word in Hebrew means justice. So, if you combine the world charity with the word justice, you begin to get a much more accurate picture of the concept. “The feeling is that it’s making the world more just by helping those in need,” said Seltzer. To that end, since the Schechter School first opened in 1996, students and teachers have dedicated part of their time to community service projects that help those in need as a vital part of their core curriculum. Recently a parent at the school, Emmett Leader, who is a professional potter, crafted a tzedakah box which has been installed at the school. It is a place where people can put financial donations that will then be distributed to those in need. Seltzer said the school soon will begin a community-wide discussion involving students, parents, and teachers to determine exactly where the money will go. And while the tzedakah box is new, the concept of collecting money to give to projects that help people in need is far from new for the school, she noted. In addition to schoolwide collections, she said, each classroom takes on its own individual project or two each year.